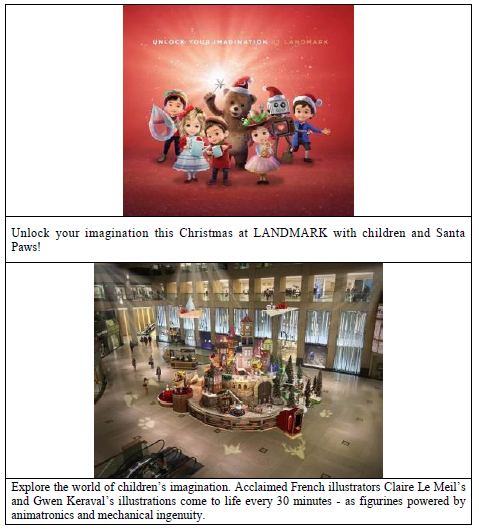 Hong Kong, 17 November 2017 – Discover the true spirit of Christmas and explore the infinite possibilities for a better world sparked by the boundless creativity of the imagination during this festive season at LANDMARK. In the culmination of ‘A Year of Wisdom’, LANDMARK’s 2017 Christmas campaign invites us to ‘Unlock Your Imagination’ and embrace the possibilities of an idealised world of child-like wonders, inspired and created by acclaimed French illustrators Claire Le Meil and Gwen Keraval. Inspired by Santa Paws, children from around the world gather at LANDMARK to celebrate the power of the imagination as the source of unlimited creativity, to imagine and build a better world. In Gwen’s portrayal of the children’s imaginative creativity, charming animated characters across 10 amazing displays, invite shoppers to marvel at their ‘inspired’ ideas to make the world a better place. 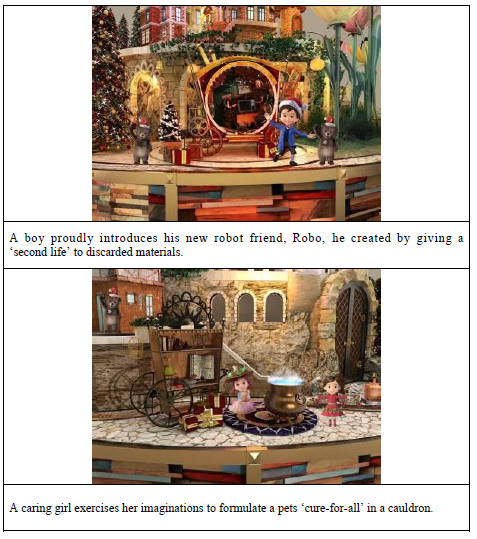 Installations include a ‘floating island’ supplying the world with unlimited clean water; ‘expanding buildings’ provide homes for all; a boy creates a new robot friend from recycled discarded materials; whilst a girl creates a special cure-all for much-loved pets. The whimsical ideas, magically made real, all represent a dazzling embodiment of creativity and imagination to embrace the spirit of sharing and hope for this Christmas. This year’s festivities also feature in the “LANDMARK HONGKONG” app, from 24 November 2017 to 1 January 2018, enabling shoppers to participate and enjoy a wide variety of Christmas entertainment and shopping rewards across LANDMARK’s iconic buildings. Shoppers can share their “Wish for a Better World” at the Wishing Machine and for every wish collected, LANDMARK will donate HK$20 to Make-A-Wish Hong Kong to help realize wishes of children with critical illnesses. Generous visitors can also donate HK$20 to receive a memorable snapshot at the “Capture the Wishful Moment” photo shooting game. Don’t forget to discover a hidden scene empowered by augmented reality within the ‘Harvest for the World’ display at LANDMARK ALEXANDRA. Stimulating children’s imaginations and wishes, LANDMARK invites everyone to enjoy ventriloquist performances and storytelling sessions. Enjoy exclusive festive merchandise, including adorable plush toys of the iconic robot and his “master”; a fabulous set of collectible craft cards; and festive tote bags featuring an array of this year’s characters, available for purchase at LANDMARK ATRIUM, with all proceeds going to Make-A-Wish Hong Kong. Shoppers and diners on a quest for Christmas gifts or wishing to enjoy a sumptuous meal with friends and family this festive season will have a chance of winning LANDMARK gift certificates valued at HK$300 on spending over HK$1,000. Upon spending HK$8,000 or more, attractive rewards of gift certificates valued up to HK$350,000 can be redeemed. Christmas shopping experiences can be enjoyed by everyone visiting LANDMARK this festive season across LANDMARK’s 208 fine stores and restaurants, imaginatively inspired by Santa Paws and all lovely children around the globe. To discover more about LANDMARK Christmas and ‘A Year of Wisdom’ and to receive our latest news and register for upcoming events, please sign up for the LANDMARK eNewsletter at www.landmark.hk. Follow LANDMARK on Facebook at facebook.com/landmark.hk; Instagram @landmarkhk and use the hashtags #unlockyourimagination #ayearofwisdom #landmarkhk. Look for LANDMARK’s Sina Weibo account at weibo.com/landmarkhk and WeChat account at “hklandmark”. Welcome to the finale of ‘A Year of Wisdom’ at LANDMARK. Make-A-Wish Hong Kong grants one special wish to children aged between three and 17 with critical illnesses, in Hong Kong and Macau, to enrich the human experience with hope, strength and joy. As of August 2017, they have granted over 1,750 wishes. They are dedicated to making every eligible child’s wish come true. Eligible for same day spending from HK$1,000 at Home and Kids stores at LANDMARK PRINCE’S, Men’s offerings at LANDMARK MEN, Beauty & Wellness located at 3/F LANDMARK ATRIUM or dining at LANDMARK.